My parents were both professionals who absolutely believed in the importance of education. My father was a manager at the wood products company in town, and my mom was a teacher who stayed at home with us until we were in high school. In many ways, my brother and I were fortunate. We had everything we needed growing up – a nice place to live, plenty to eat, and nice clothes. We didn’t get all of the trendy items to “fit in.” Getting comfortable with being different was something our parents wanted to cultivate in us. There was some drama and conflict, but overall, we were safe and comfortable. My parents were very clear that our “jobs” were to get good grades, to do our homework, and to participate in extracurricular activities. They knew we could “make” more money with scholarships than we ever would working in a very small town with limited job opportunities. In general, they were right. I managed to get a scholarship that paid half my tuition and my parents paid the other half, allowing me to graduate without student loan debt. While I am grateful for my good fortune, in some ways I think we missed out by not making the connection early on between work and money. If we’d had jobs, we might have made the connection on more of a gut level. If that wasn’t possible, some sort of consistent allowance system might have helped. As it was, money was sort of a mystery, and quite taboo. My first grown-up job was for an information technology (IT) company in Columbus, Ga. I found the change from studying (where you get more and more freedom as you move from high school through college) to working for a company (with what felt like much less freedom), very jarring. I was always a “teacher’s pet” type of student, and fully expected to be “manager’s pet” out in the real world. As it turned out, clever ideas were not always welcome inside corporate America. Looking back, I probably didn’t understand enough to truly have good ideas, but the feeling was just one of not fitting in. I got married and moved from Columbus to Atlanta, figuring the big city would cure my career troubles. While things improved somewhat, I still felt stifled by the corporate world. I am very task oriented, and I believe that if I focus and finish all my work I should be done for the day. In most offices, that was not true. Being physically present in case you are needed, building rapport with your co-workers by hanging out and complaining, and being seen giving the impression of working count for as much, if not more, than actually accomplishing tasks. The one good financial side effect of being so uncomfortable in the corporate world was that I did save for retirement, because getting out as quickly as possible was on my mind from the beginning. At the same time, though, I was dabbling in credit card debt. So, despite my savings, my net worth stayed around zero. I didn’t really have the concept of building my net worth as something on which I was supposed to be working. I don’t think it had ever been mentioned to me. Once we bought our first house, our net worth went well into negative territory. Perhaps if I’d been in a more flexible role or in an industry I’d really loved, my experience in the world of the regular job would have been better. I always felt like a square peg trying to fit in a round hole. So, when I was approached by a network marketing company, I was an excellent candidate for them. I was willing to work, and I liked the idea that the criteria for promotions were really clear. Meet the qualifications, get the new title. There was no room for sexism or favoritism, no waiting until a job opened up or management deemed me worthy. Network marketing appealed to my desire for freedom, and gave me a great platform for personal growth. Initially I believed what the company was telling me, and I was pretty good at spreading the word. I built a team of more than 30 people, rose to the top 2% of the company, quit my full time job, and earned the use of two company cars. The training was amazing. I was introduced to the entrepreneurial and abundance mindsets. During this time, I learned many of the techniques that I use with clients now. Despite all the success, my paychecks never equaled what they had in the corporate world. Variable income is a challenge for many in sales or recruiting roles, and I was no different. Making a big check one month from my recruiting efforts and then stopping recruiting to deal with all the new team members meant no commissions the next month. And with the car, if you didn’t earn enough for them to cover your car payment, they sent a bill for the lease amount. I began to lose faith. If things at this level were not what they’d seemed when I started, how was I to believe all would be as promised at the next level if I got there? Many network marketing companies make their money from front-loading recruits with product they’ll never sell. These companies hope that the new team members won’t return the product and will just let it go bad in garages and basements. It all felt wrong. Additionally, all the nights and weekends of work were putting a strain on my marriage, and all the product ordered to meet a goal or to be sold in the future was straining my credit card. Our finances were not great during this time. I had stopped saving for retirement since I was hardly making any money. What I did make was being “reinvested” in conferences and events. Plus, we were all being sold the dream that we would reach the very top level of the company, and the organization would buy our businesses back in a lump sum that would fund our retirement. While my husband and I never had any desire to keep up with the Joneses, we did do what we thought was normal with our money at this time. High credit cards? Take out a HELOC to refinance them at a lower rate. If they get used again – well, oops. It never occurred to us that we were literally putting our home at risk and turning unsecured debt on miscellaneous stuff into debt that was secured by the roof over our heads. We climbed the property ladder, from a starter home to a larger home – because I believed that was “forced savings” and that we were building equity. We had a four bedroom house. Did I mention we don’t have kids? We had a big truck (named Lord Truckington) and an SUV. We thought we were smart because we bought them used. Around this time, my husband began to feel burnout from working so much as a consultant. A friend of ours mentioned that he’d bought a vacation home, and that had given him a much-needed break. I decided that a second home clearly was a required expense (I know, right?!? ), and so we bought a lake house and started paying all the corresponding bills. Workwise, I knew I had to leave the network marketing business, but I also couldn’t go back to corporate. The mental shift from employee to entrepreneur was permanent. I’d had a taste of the freedom and personal growth that I value so highly, and so it was further into entrepreneurship for me. I started and quickly built a small services firm doing professional organizing. After the initial learning curve, I got bored with the work. Around that time, my husband and two of his co-workers from an IT consulting company were starting their own team and they needed someone to help with sales. Between my background in IT and my background in sales, we figured I could get the hang of IT sales. Simplified Technology Solutions has been a great business classroom for me. The work ethic and mindset from network marketing, combined with the ability to read financial statements I was getting from the classes and training we participated in as a startup, were giving me a better understanding of business finances. As we were starting the firm, we worked with a financial advisor, who also connected us to a financial planner for some of the more complex issues facing the business. That Certified Financial Planner(™) really helped to slowly shift my mindset. As with the network marketing business, I was convinced that at some point there’d be a buyer for our company, and there’d be a big windfall to serve as our retirement, so I didn’t think we needed to save for retirement. But the CFP pushed us, pointing out that retirement savings was a way to reduce our tax bill for the current year. And it’s good we did set that money aside, as it has grown into quite a nice nest egg over the years. I started tracking net worth for our twice-yearly meetings with the planner, which finally got me focused on building wealth. I read books and blogs, attended classes and courses, and slowly I experienced yet another major paradigm shift – from consumer and spender to wealth builder. We relocated from the big house on the fashionable side of town to a just fine size house close to our biggest client. We sold Lord Truckington (my husband’s still not completely over this, but he’s coping) and the SUV and are now sharing a used Honda Civic. The vacation rental is still our weekend retreat. Now, though, when it is not in use it is rented on HomeAway and very nearly pays for itself. We now max out our retirement accounts every year and are saving and investing outside of retirement as well. About a year ago on a visit to our CFP, he mentioned that we were on the path to Financial Independence. I wasn’t sure exactly what that meant, but it sounded awesome, and so I came home and Googled Financial Independence. From there I found the FI community, and the rest is history. We’ve gone even further into the FI lifestyle. For a while I was a bit upset with my parents that they didn’t teach us about the need to build our net worth. But then I realized they couldn’t teach us about this, because they never needed to do it. 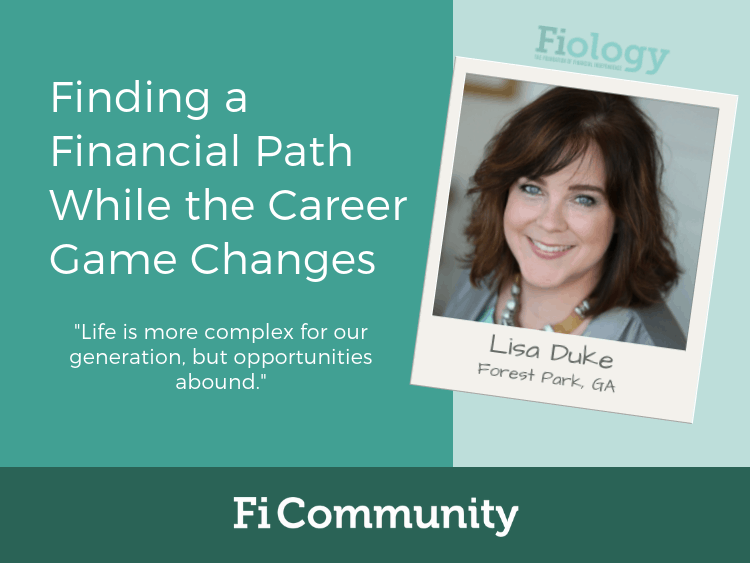 The career and financial game changed between our generations. In addition to Social Security, each of them has a pension from their past employers to supplement their savings. Income for life is pretty sweet, but for our generation it isn’t available in most careers. I’m grateful for their example of being good providers and sensible and thoughtful spenders they provided, but when it comes to becoming wealthy in terms of investments, we are breaking new ground. I believe, for our generation, becoming millionaires isn’t a pipe dream – it’s a basic requirement if we want to continue our lifestyle beyond our 50s. Part of what I love about the Financial Independence Retire Early (FIRE) movement is that it is so radical. Shoot for FIRE and, if you fail, you will still end up ahead of where you otherwise would have been. Failing to save half your income, but instead saving 25% of your income, will lead to a much better result than if you’d ignored the issue altogether or whined about your inability to save anything while continuing to get deeper in debt. I have become so concerned about the lack of financial education and the need for wealth building that I’m blogging and speaking on financial topics now. This has led to some opportunities to do paid financial coaching, and I’m hoping to grow that business into another stream of income while continuing to work in our IT consulting business and with our vacation rental. Life is more complex for our generation, but opportunities abound. Wow, what a shift! It sounds like you learned the best way possible, and I wonder if you would have progressed to such a point if you had learned your financial lessons from your parents versus learning the hard way. Thanks for sharing your story! A wonderful story of breaking out of the “American Dream” mindset that we all get caught in at some point early in our journey. Sometimes it is hard to fall back into that same mindset that got us stuck in the first place but through perseverance and determination others can stay on the right path to FI as you and your husband did. Thank you for sharing your journey with us. It is awesome to see you now helping so many others with your blog and financial coaching! I certainly enjoyed reading the evolution of your story. And I think that you brought up something important which I had not thought about and for that, I thank you. The Baby Boomers don’t have the same financial problems that Generations X and Y have. Which is part of the reason I think is why it can be hard for many people to understand the concept of FI. The American Dream is really a facade to the Rat Race. I’m glad to hear that you’ve changed your mindset and have made lemonade with your financial lemons. I had career flashbacks reading about your experience transitioning from teacher’s pet to not-so-much manager’s pet. That was definitely a culture shock for me, too. I’m glad you were able to piece together your corporate and entrepreneurial experiences to help craft what sounds like an amazing business. Also, I picture Lord Truckington with a giant monocle and top hat, which amuses me.